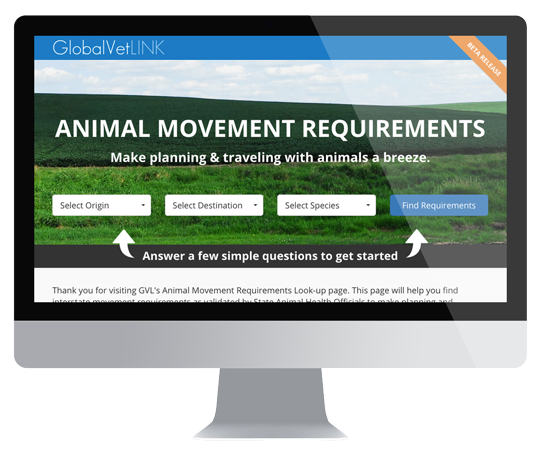 The GVL® Animal Movement Requirements look-up webpage is available at Animalregs.com. This website focuses on movement requirements for cattle, horses, pigs, sheep, goats, deer, dogs and cats for a number of states. GVL works closely with state animal health officials to ensure the most accurate information possible is available. Please select a geographic region to view contact information by state regarding animal admission requirements. A link to each state’s official web site describing such regulations is also provided. You can also look up interstate animal movement requirements at animalregs.com. The USDA APHIS website provides information about international export of animals: IRegs for Animal Exports (not affiliated with GVL).